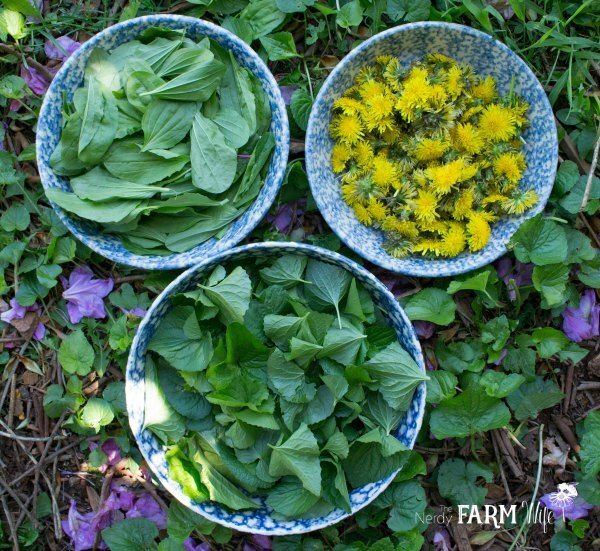 Learn how to easily harvest & dry flowers and herbs from the garden. Also included is a list of common flowers and herbs along with ideas for using them! 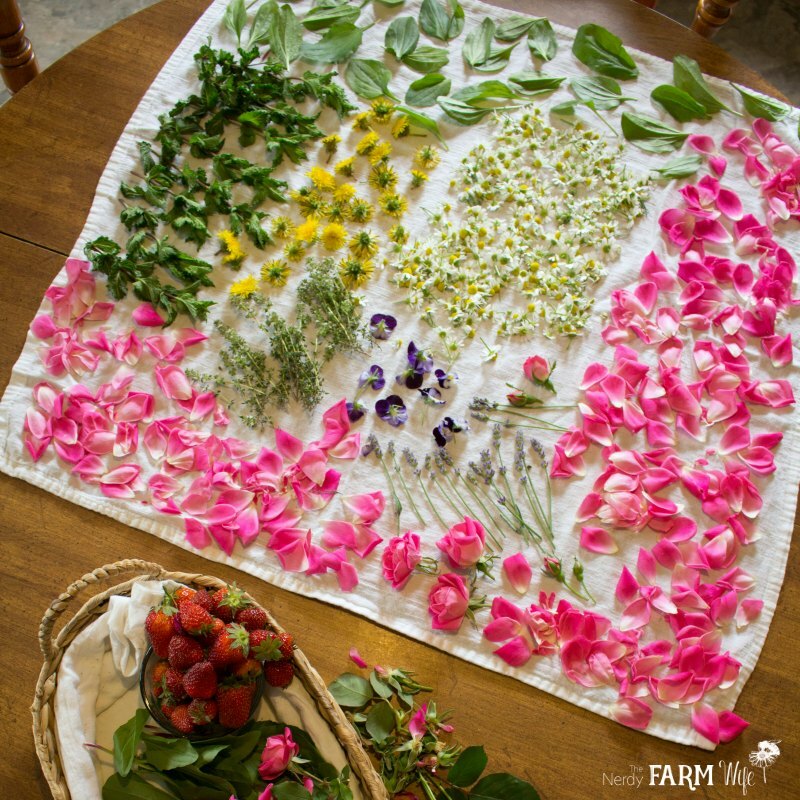 I often get questions about how to best harvest and dry flowers and herbs from the garden, so today I thought I’d write up a little article detailing how I do it. An ideal time to collect fresh flowers and herbs from your garden is on a dry sunny day, after morning dew has evaporated, but before the midday sun is out in full force. Some flowers, such as dandelion, chamomile, calendula and lavender can be dried whole. 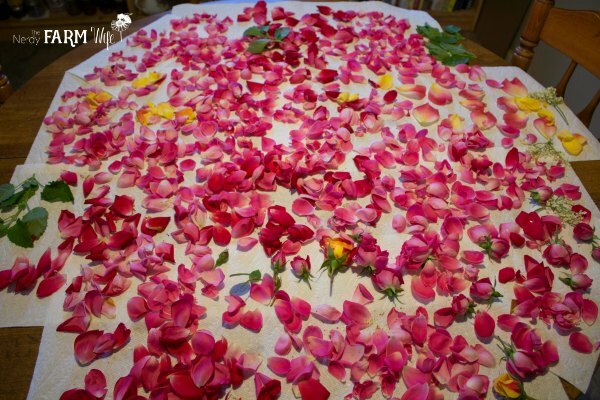 The petals from larger flowers, such as roses and hollyhocks, should be separated from the flower head before drying. An exception to this is if you’re drying small rosebuds. They can also be dried whole, just be sure to turn a few times a day so one side doesn’t dry flatter than the other. I dry flower clusters, like elder flowers and lilacs, upside down on a towel as shown above, to help preserve some of the shape. Small branches of leaves that easily lay flat when placed on a surface, such as elder leaf, can stay together while drying. Leaves that cluster together, like lemon balm and mint, often do best if you detach each leaf before drying. Spread your flowers and herbs out in a single layer over a clean dish towel or several paper towels. It’s okay if a petal or two overlaps every now and then, but avoid piling the plants on top of each other or they’ll quickly start to self-compost. Try to choose an area in your house with good air circulation and where the collected plants won’t get disturbed or exposed to long stretches of direct sunlight. (Indirect sunlight is okay.) I usually use my kitchen table or empty spots on my counters. Once or twice a day, check how everything is drying and turn over individual pieces so that they dry evenly on both sides. If you own one, a dehydrator is also a great way to dry herbs, especially if you’re in a hurry. Follow manufacturer’s directions, or dry on the lowest heat setting, checking every hour or so. You’ll be able to tell when a flower or herb is completely dry if you rub a piece between your fingers and it feels crisp and easily crumbles. If it still feels moist or is overly pliable, try drying longer. 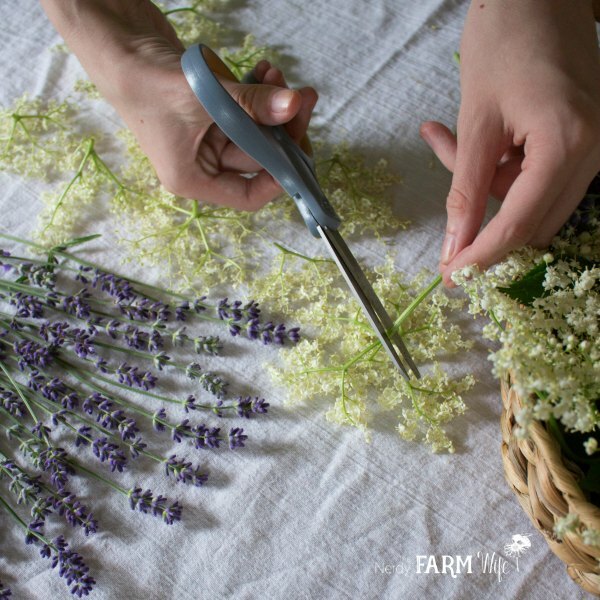 Once completely dry, you can store the herbs and flowers in clean dry canning jars or in brown paper bags. I like the durable ones shown below that I purchased from Mountain Rose Herbs, but brown lunch bags work too. For longest shelf life, keep your dried herbs and flowers stored out of direct sunlight and in a non-humid area. Leave the herbs in whole form as much as possible and don’t crush or powder until you’re ready to use them. This helps to preserve the aromatic essential oils within the plant as long as possible and helps extend freshness. Your dried herbs should stay usable for 9 months to a year if stored properly. As flower or leaf color fades, so does potency. Herbs that have turned dull and colorless are past their prime and should be composted. These are a few of my favorite garden flowers and herbs that I like to dry and keep on hand for various projects. Calendula – These sunny flowers are loaded with powerful skin-healing, anti-inflammatory and antimicrobial properties, yet are gentle enough for most people and animals to use safely. You can make all sorts of things with calendula, including soap, salve and lotion bars. Chamomile – The flowers are anti-inflammatory and antibacterial; they’re extra nice to include in preparations for sensitive skin. Some recipes on my site that incorporate chamomile include these these shampoo bars, sensitive skin lotion and soothing lip balm. Cornflower (Bachelor Butter) – These flowers are pretty when dried and added to bath soaks and teas for their mild anti-inflammatory properties. Dandelion – The flowers are especially treasured for their mild analgesic (pain-relieving) properties, making them an excellent addition to products designed for sore muscles or other external aches and pains. They’re also traditionally used in preparations to heal rough chapped skin. For some project ideas, read 12 Things to Make With Dandelions. Elder Flower – The flowers are an old-fashioned remedy for clearer skin, promote wound healing and may be helpful for eczema and dry skin. 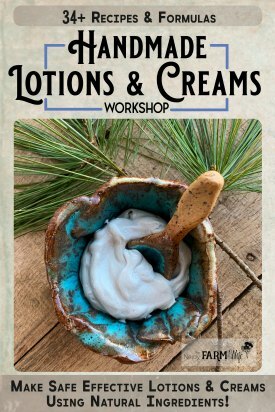 I hope to add more elder flower recipes to the site soon, but until then you may enjoy this lotion recipe that includes elder flowers or this elder leaf salve. Hollyhock – These pretty old-fashioned flowers are related to the marshmallow herb and in some cases can be used as a substitute in a pinch. For a few ideas for using them, check out these five uses for hollyhocks. Lavender – This sweetly scented plant is anti-inflammatory, soothes skin and eases stress. For project ideas and recipes, you may enjoy reading these 1o things to make with lavender. Lemon Balm – This prolific plant is a mild stress reliever with notable antiviral properties. More information on utilizing lemon balm can be found by reading 12 things to make with lemon balm. Mint – The leaves of this plant are cooling and pain relieving. Mint is also great for stomach aches, nausea and headaches. If you’re looking for ways to use mint, you may enjoy this cucumber mint bath soak or these other mint ideas. Plantain – Plantain is a common leafy green weed found all over the world. It’s specific for treating skin problems such as acne or eczema. It’s also antiseptic and astringent and is the ultimate plant to grab for first aid in the field. Learn more by reading these 10 things to make with plantain. Rose – Besides being enjoyable to look at and smell, their cooling, soothing, anti-inflammatory and mild astringent properties make them ideal ingredients in many body care products and herbal remedies. For ideas on using these lovely flowers, check out 10 things to make with roses. Sunflowers – These cheerful blooms have skin-soothing properties. Like cornflowers, they make a pretty addition to bath soaks and teas. 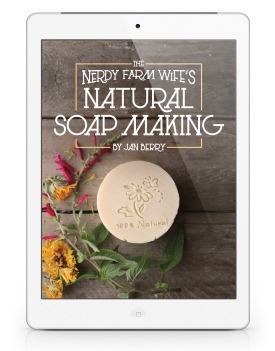 If you love sunflowers, you may also enjoy this sunflower soap recipe. Violet Flower & Leaf – Violets are not only lovely to look at, but are cooling and healing. They’re especially useful for soothing irritations and eczema when used on your skin. For some project ideas and inspiration, read 10 Things to Make With Violets. Tagged calendula, chamomile, dandelion, elder, lavender, lemon balm, mint, rose. Bookmark the permalink. 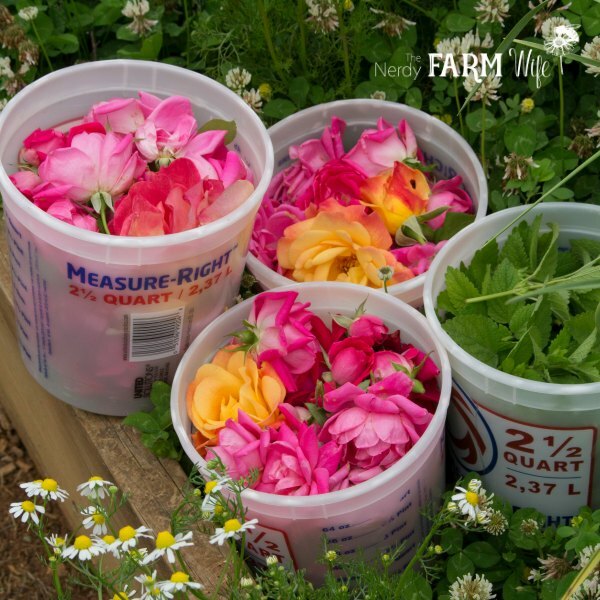 Good information thanks Jan. Any stored herbs or flowers I have that become too old are not placed in the compost but given to our chickens – either thrown on the ground for them to peck or placed in their nest boxes. I’ve been reading about how to oven dry herbs. Essentially put them on a lined baking sheet in an oven that has been preheated to 170 degrees. When you put the herbs in turn off the oven and let them dry as the oven cools down. Is this method to harsh for herbs like calendula, chamomile, echinacea, lemon balm, lemon verbena and mint? I don’t have a dehydrator and live in a very humid area. Hi Sue! It’s worth a try, especially since you live in such a humid area. The only thing I can think of is that you want to be sure to keep temps as low as possible to preserve potency, so when preheating the oven, I’d keep the door cracked so it’s not *too* hot when you first put the herbs in. Hi, where did you learn all this great ” herbal” info? Love to learn about these things. One day I will try to apply some of this interesting info. Very intriguing. Thankyou for sharing. do you have a recipe for making rose and peony soap? Hi Lorna, I sure don’t, but I love that idea! I’ll have to try that out one day – it sounds lovely! I’ve been visiting your website almost daily for close to a year. You’ve taught me so much :-)) Your dandelion and calendula posts have inspired me to dry and use other flowers the same way. I live in Central Canada where we have some amazing wildflowers. I did some research on red clover and birdsfoot trefoil which both grow in abundance here. I was wondering if you can think of any reason why I would NOT be able to dry and infuse these flowers for use in soaps, salves and lotions. Happy summer!!! Hi Sandi, I’m so glad you’ve been enjoying the site! You can definitely use red clover! As far as the birdsfoot trefoil, that’s one I haven’t looked into yet, so I’m afraid I’m not sure on that one. 1. 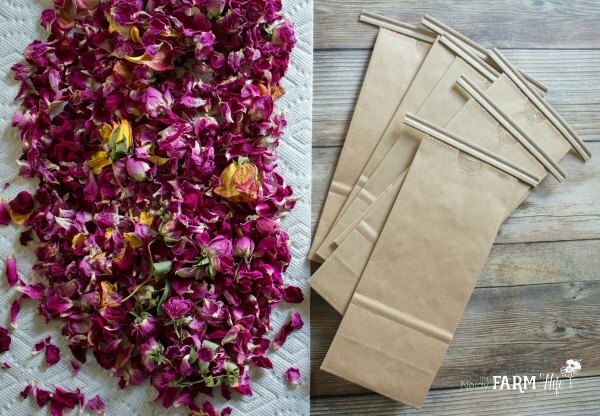 Can I dry flowers outside to reduce drying time if they’re not in direct sun and are covered securely with paper towel or landscape fabric? 2. How important is it for flowers not to touch when laying them to dry? I understand the importance of a single layer, but I’m not completely sure I understand why they shouldn’t touch. Perhaps I’m taking it too literally? Thanks for the time and effort you put into this site! Thanks so much for this post. It’s packed with helpful information and great ideas. Beautiful photos too!